To use these word finders, have students find words that you are learning by placing the word in the “window” of the bus. Great for sight words and word work! You can also find numbers on a number chart to show the answer to an equation, to practice place value, or number recognition. 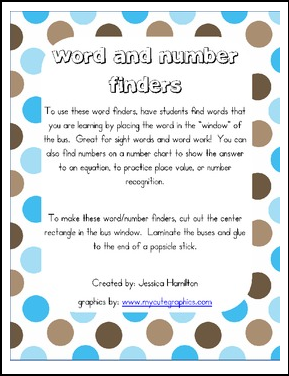 To make these word/number finders, cut out the center rectangle in the bus window. Laminate the buses and glue to the end of a popsicle stick.